You’re in charge! How do you want to communicate? A VersaTube building specialist is standing by to answer your questions. We respect your privacy and won’t share your information with others, or bombard you with calls. Welcome to the VersaTube structure designer. You can design a custom VersaTube structure by using the designer tools on this page. If you've used this page before you can retrieve your designs by entering in your design ID on this page. Zip code is used to correctly configure structure for your local wind & snow loads. The zip code where the structure will be delivered. Is this a store address? Grand allows for vertical application of roof sheet metal panels. 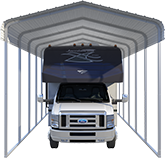 Classic allows for horizontal application of roof sheet metal panels. You are accessing VersaTube site from a mobile device. 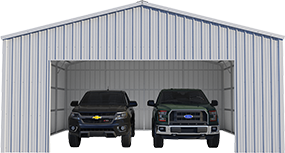 Please click button to launch Garage Door, Walks Door & Window Openings Editor. Would you like to add insulation to your structure? The lean-to will not be insulated. Use plus sign button to add openings to your building. Once element is added to the workspace you can adjust it by using handles. Use side tabs to add openings to desired sides of the building. Once you are satisfied with placements, finish editing. Please select roof / trim / sheet metal color combinations below. Important note: Image displayed below is a sample structure. Will you anchor your structure to the ground or on concrete? WILL YOUR MUNICIPALITY REQUIRE CERTIFIED STAMPED DRAWINGS AND CALCULATIONS? DO YOU REQUIRE FOUNDATION CALCULATIONS? * Source: IBC 2009 data for Collierville, Tennessee 38344 in Shelby County. Pledge is our way of showing that we're proud of our products and the level of quality that they represent. Your building will go through an extensive inspection process prior to leaving our plant, but if any component should not meet your expectations, we'll be glad to replace the part at no charge within 30 days of purchase. The only criteria that must be met is that you bought the building from VersaTube, the damage wasn't caused by customer modifications or mishandling, and that the building was erected within 30 days of purchase. 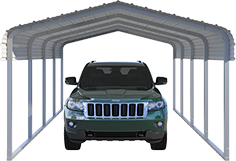 The second part of the VersaTube Product Pledge provides a 20 year structural warranty on all framing components of our buildings from the date of purchase. Of course, the defect can't be caused by customer modifications or negligence, an unanticipated Act of God or nature, an accident, or any type of internal or external impact. Improper assembly or installation may also void the warranty. The customer is responsible for performing standard building maintenance and inspections on a regular basis. We reserve the right to repair or replace any part that might not meet expectations. VersaTube is proud to put our name on the buildings we manufacture for our customers and stand behind their quality with our industry leading Product Pledge. VersaTube structures come pre-engineered and are designed for a DIY installation. This is a video animation of a similar [ProductType] style structure's parts being assembled. You can retrieve it by entering the code at this same page at any time. You can also share it with VersaTube representative to get a quote. You have selected certified stamped drawings and calculations. Your structure will be sent to the VersaTube Design Studio where it will be tested to meet your local municipality's engineering requirements. is 50% of your structure's estimated cost and must be paid today as deposit. This deposit is refundable if you do not approve the certified stamped plans. is the amount VersaTube charges to design, certify & stamp, and mail these drawings to you. is the estimated amount of time it will take our design studio to prepare your certified stamped drawings and calculations. Once you approve your certified stamped drawings and calculations you must pay the remaining 50% of your structure's value before it can enter production. If you approved your plans today we estimate the lead time for this structure to be [x] days. Wind and / or snow load are too high. This building cannot be engineered. Structure cannot be taller than it is wide. Please lower the height or increase width of this structure to proceed. Please contact your VT sales rep to help you design your buildings. Due to market conditions price has changed from last time you designed your product. 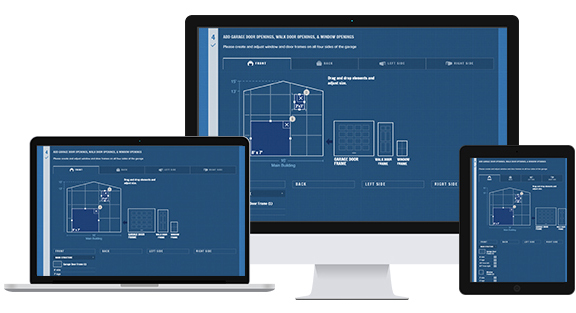 Foundation calculations are no longer available for this Design ID. Design ID you submitted is not found in the designs database. Please try again. A VersaTube structure specialist is standing by to answer your questions. WHEN IS BEST TIME TO CALL YOU? WHAT IS YOUR NAME AND MOBILE NUMBER / EMAIL? Our designer works best on larger screens. The drag and drop feature for adding window and door openings is disabled on smartphones. We recommend you use a tablet, laptop, or desktop for the best experience.